By Angeline Eliakopoulos – 57 pgs. 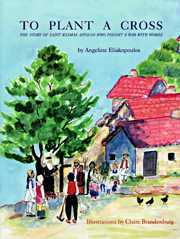 This is an illustrated children’s book telling the life of St. Kosmas Aitolos, a monk who left the Holy Mountain of Athos with a blessing after 18 years of preparation to spread the message of hope in Epirus and Greece in missionary journeys from 1760 to 1779 when he was martyred by the Turks. St. Kosmas used in particular both Orthodox education in the founding of Orthodox schools and the use of the Jesus Prayer to rekindle the light of Faith back into the hearts of those suffering under the long Turkish occupation of these former Orthodox lands and the strong persecution then of Christians.